Rabies has long been thought to be an invariably fatal disease with few reports of survival being available. Because of the fulminant course of the disease, imaging is mostly not possible in these patients. Even though rabies is definitively confirmed by the isolation of virus from biological samples or detection of the rabies antigen or antibodies, diagnosis is essentially clinical and magnetic resonance imaging (MRI) brain can be used as one of the modalities of investigation for the early detection of rabies and for distinguishing it from other encephalitis. A 5-year-old male child was bitten on the hands and face by a dog. Three doses of the antirabies vaccine were administered. One month after the bite, he presented with prodromal symptoms in the form of fever and malaise followed by altered sensorium, drowsiness, and irrelevant talking. On physical examination, he showed increased muscular tone in all four limbs, with hyperreflexia. Extensor plantar responses were seen bilaterally. No signs of meningitis were seen. To rule out other causes of neurological deficits, MRI brain was done. On the 6 th day after the onset of symptoms, MRI brain was performed on a 1.5-Tesla scanner (Magnetom Avanto 18 channel 1.5 Tesla by Siemens India Pvt Limited), which revealed ill defined T2/fluid-attenuated inversion recovery (FLAIR) hyperintense lesions involving the dorsal aspect of the medulla, pontine tegmentum, periaqueductal gray matter, collicular plate, as well as the central white matter of the midbrain. Foci of hyperintense signal were also seen in bilateral thalami, hypothalami, and hippocampi. 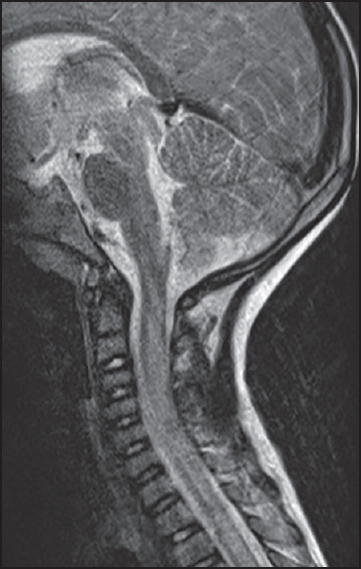 T2/FLAIR hyperintensities were also seen in cervical cord. The involved regions showed low signal intensity on T1-weighted (T1W) imaging. Diffusion-weighted (DW) imaging revealed a mild increase in the apparent diffusion coefficients (ADCs) in the involved regions. No evidence of blooming was seen in these areas. There was a subtle mass effect with effacement of the aqueduct and third ventricle. The basal ganglia and cortical gray matter and white matter showed normal signal intensity. 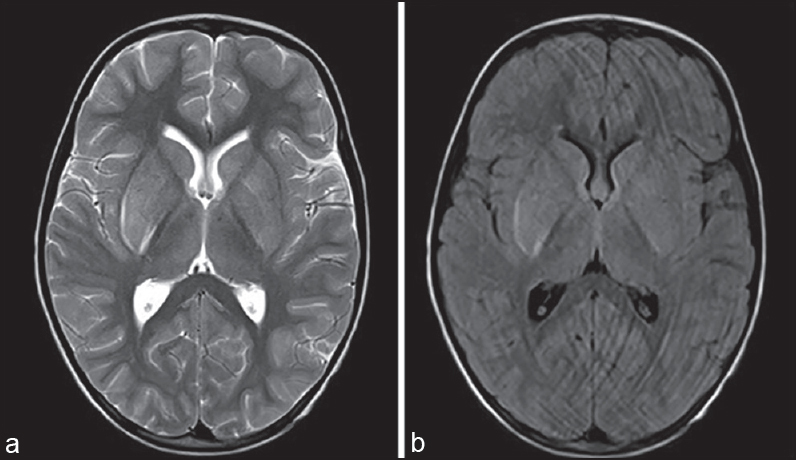 The findings were consistent with those described in prior reports of rabies encephalitis [Figure 1], [Figure 2], [Figure 3], [Figure 4] and [Figure 5]. Blood glucose, serum electrolytes, renal function tests, and liver function tests were found to be within normal limits. The neurological status of the patient continued to deteriorate. After 3 days, the child expired. Considering the characteristic clinical presentation and rapid progression of the illness to death, laboratory confirmation of the disease was not obtained. An 8-years-old male child presented in pediatric emergency with 5 days history of fever, altered sensorium, episodes of abnormal body movements, and agitation. Child had history of dog bite on face about 18 days back prior to admission, but he did not take any vaccination for that. He also showed features of aerophobia and hydrophobia. On physical examination, he showed increased muscular tone in all four limbs, with hyperreflexia. No positive meningeal signs were present. Routine renal function tests and liver function tests were normal. 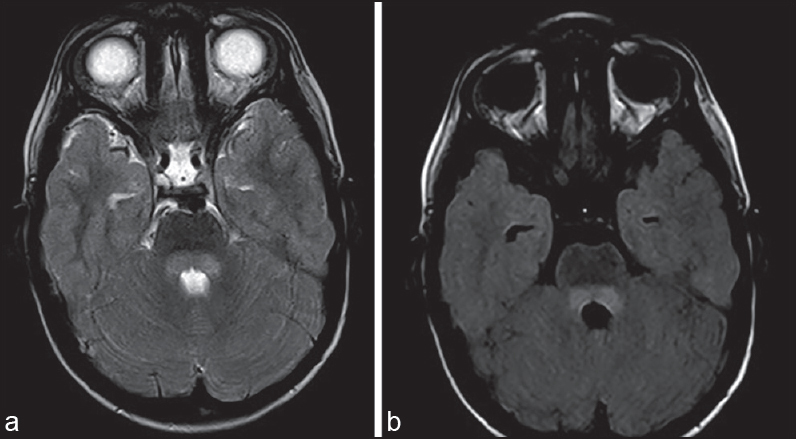 MRI brain performed on 1 st day of admission revealed ill-defined T2/FLAIR hyperintense lesions involving [Figure 6], [Figure 7], [Figure 8], [Figure 9] and [Figure 10] the dorsal aspect of the medulla, pons, periaqueductal gray matter, collicular plate, as well as the central white matter of the midbrain, superior and inferior cerebellar peduncles, bilateral thalami, hypothalami, and hippocampi. In addition to these findings, in this patient bilaterally symmetrical abnormal T2/FLAIR signal was also seen in basal ganglia and subtle gyriform hyperintensity was seen in cortex in left temporoparietal region with blurring of cortex and white matter junction. And like previous case, T2/FLAIR hyperintensities were also seen in cervical cord as well. The involved regions showed again low signal intensity on T1W imaging. DW imaging revealed a mild increase in the ADCs in the involved regions. No evidence of blooming was seen in these areas. There was a subtle mass effect with effacement of the aqueduct and third ventricle. The cortical gray matter and white matter showed normal signal intensity. So, findings were same as previous case plus there was symmetrical basal ganglia involvement and involvement of left parietooocipital cortex. There was rapid progression of symptoms and child died within 3 days of admission. Owing to the characteristic clinical presentation and the difficulty in handling the agitated patient, imaging studies are rarely performed. However, imaging of the brain may be used as one of the modalities of investigation for the early detection of rabies and for differentiating it from other encephalitis. 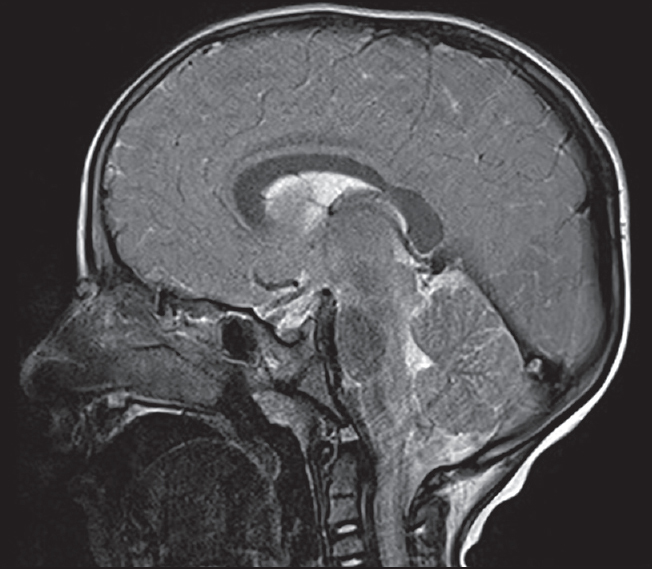 Computed tomography (CT) findings of rabies encephalitis include bilateral symmetric, nonenhancing hypodense lesions involving the basal ganglia. Other regions of the brain involved by rabies encephalitis such as brainstem and hypothalamus are poorly visualized by CT scan. 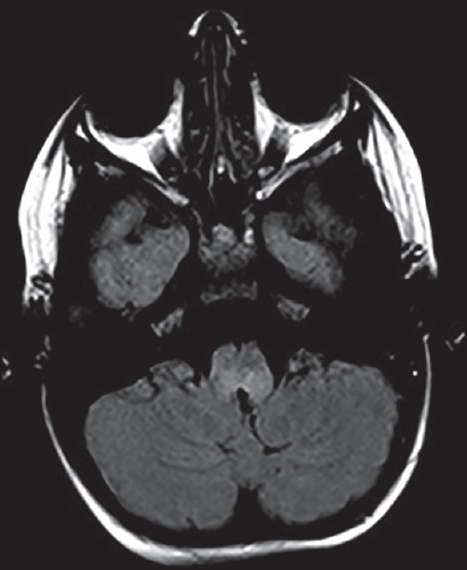 MRI findings in encephalitic form and paralytic form show ill-defined hyperintense lesions in the brainstem involving the dorsal aspect of the medulla, pontine tegmentum, periaqueductal gray matter, collicular plate, as well as the central white matter of the midbrain, deep and cortical gray matter, deep and subcortical white matter, hippocampi, medial aspects of the thalami, and in the hypothalamus on both sides of midline on T2W imaging. , In our cases also, all the findings were same on T2W imaging. In addition, T2 hyperintensity were also seen in the bilateral basal ganglia and left temporopareital cortex in case no.2. There is also role of DW/ADC maps which show increased diffusion in rabies encephalitis. However, there are few case reports which show that diffusion restriction can also be seen in involved areas. In our cases also increased diffusion was seen on DW/ADC mapping. It is difficult to differentiate paralytic form of rabies from Guillian-Barre syndrome and myelitis in which there is involvement of spinal cord, but typical history of dog bite and rapid progression of disease helps differentiate them. 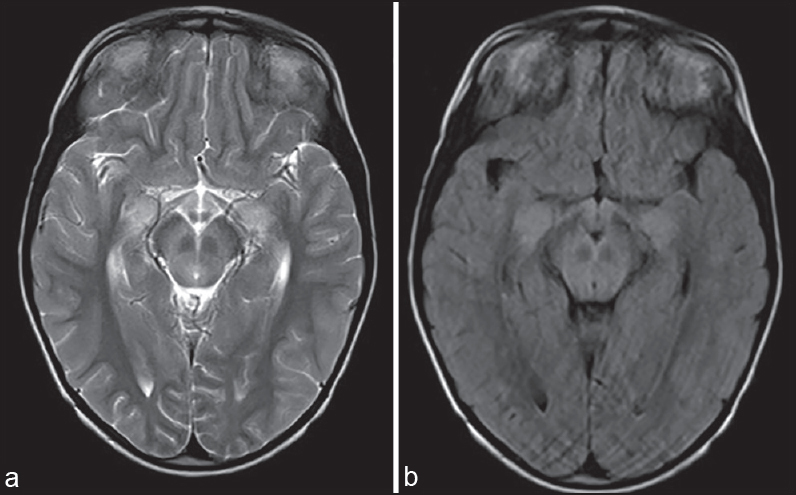 So we conclude that though rabies encephalitis has classical clinical features, MRI is the imaging of choice for its early diagnosis and it helps to differentiate rabies encephalitis from other encephalitis. Early diagnosis of rabies does not have any impact on patient prognosis, but it does enable prompt institution of public health measures. Awasthi M, Parmar H, Patankar T, Castillo M. Imaging findings in rabies encephalitis. AJNR Am J Neuroradiol 2001;22:677-80. Vaish AK, Jain N, Gupta LK, Verma SK. 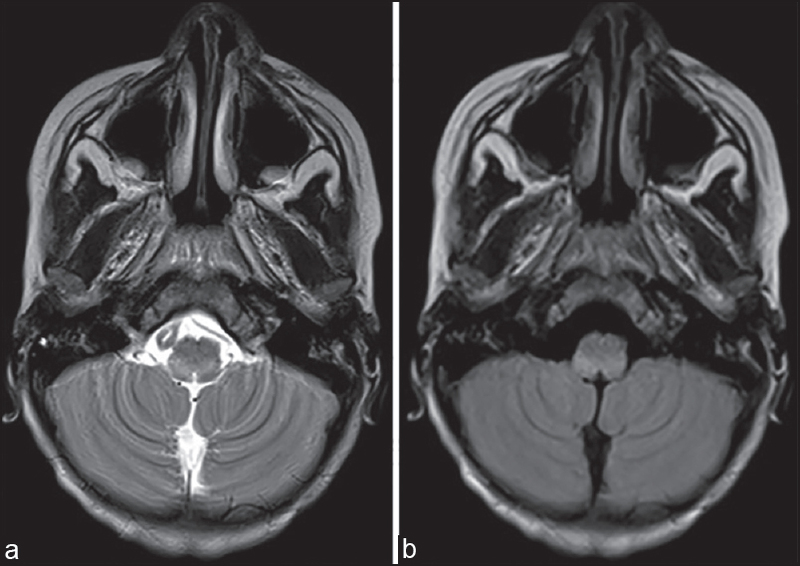 Atypical rabies with MRI findings: Clue to the diagnosis. BMJ Case Reports 2011;2011. Laothamatas J, Hemachudha T, Mitrabhakdi E, Wannakrairot P, Tulayadaechanont S. MR Imaging in Human Rabies. AJNR Am J Neuroradiol 2003;24:1102-9. 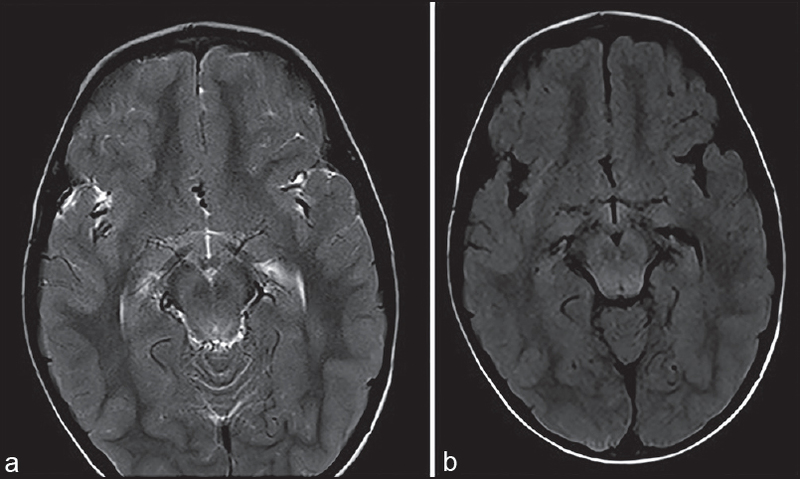 Rao AS, Varma DR, Chalapathi Rao MV, Mohandas S. Case report: Magnetic resonance imaging in rabies encephalitis. Indian J Radiol Imaging 2009;19:301-4. Jain H, Deshpande A, Favaz AM, Rajagopal KV. 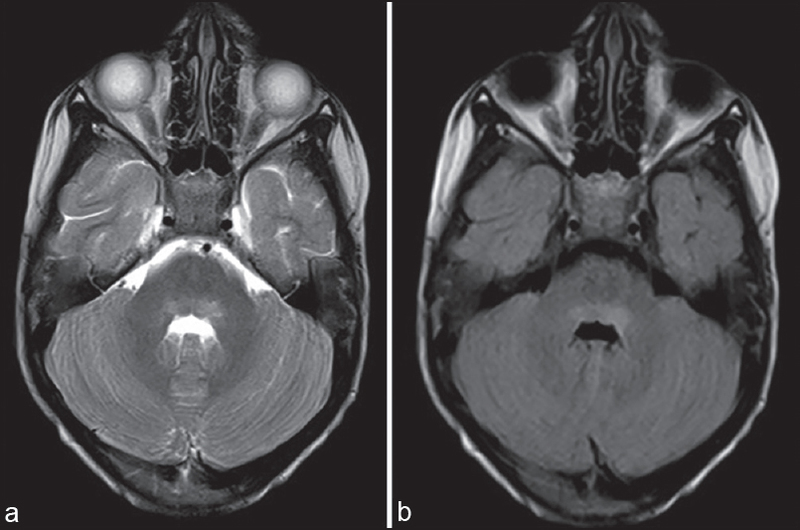 MRI in rabies encephalitis. BMJ Case Reports 2013;30:2013. Tirawatnpong S, Hemachudha T, Manutsathit S, Shuangshoti S, Phanthumchinda K, Phanuphak P. Regional distribution of rabies viral antigen in central nervous system of human encephalitis and paralytic rabies. J Neurol Sci 1989;92:91-9. Jain M, Mathur RK. 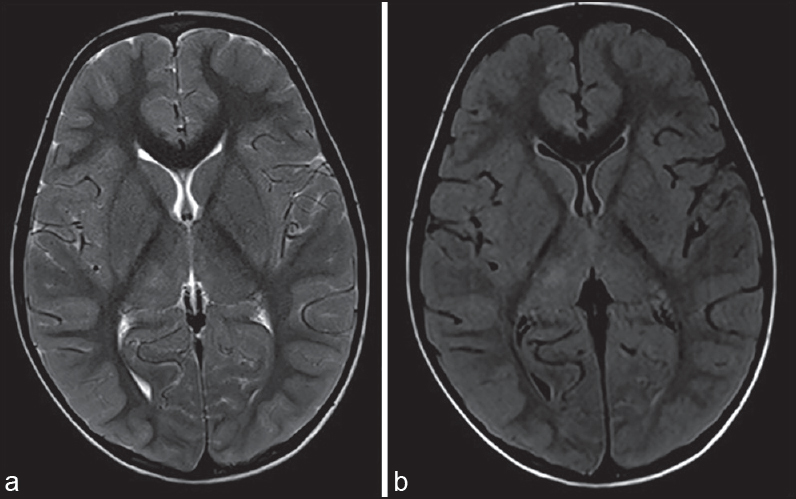 MRI in Rabies Encephalitis. Available from: http://www.maxhealthcare.in/newsletter/max-medical-journal/may-11/mri-in-rabies.html [Last accessed on 2015 Mar 24].